In the top right hand corner are Pathfinders who are fully engaged and take a long term perspective. Below them, in the bottom right-hand corner, are Organizers who are highly engaged but take a short term view. Next door to them, in the bottom left-hand corner, are Onlookers who take a short term view and have low engagement. 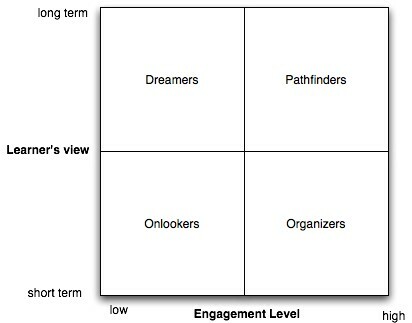 Above them, in the upper left-hand corner, are Dreamers who have a long term view, but have low engagement. 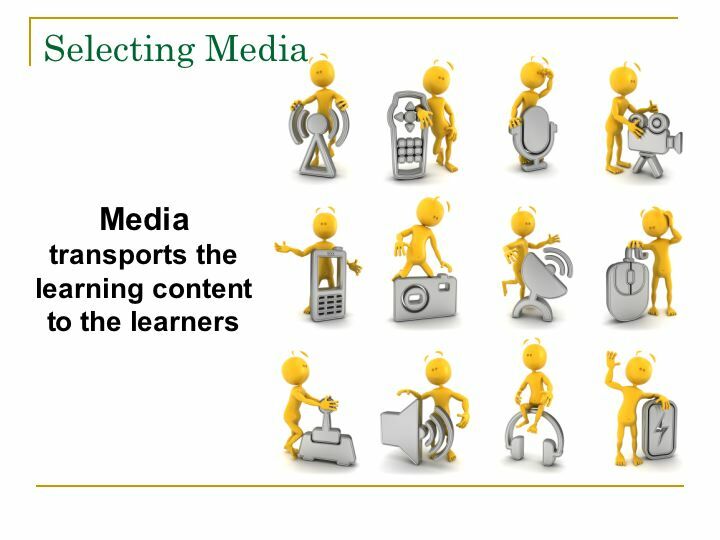 This would be a helpful tool for selecting a learning platform as most other methods look at the task, while this method looks at the needs and behavior of the learners and how they view a particular task. A Pathfinder is someone who really needs to learn the task because she is going to be using it for the long-term and will be fully engaged during the entire time frame. 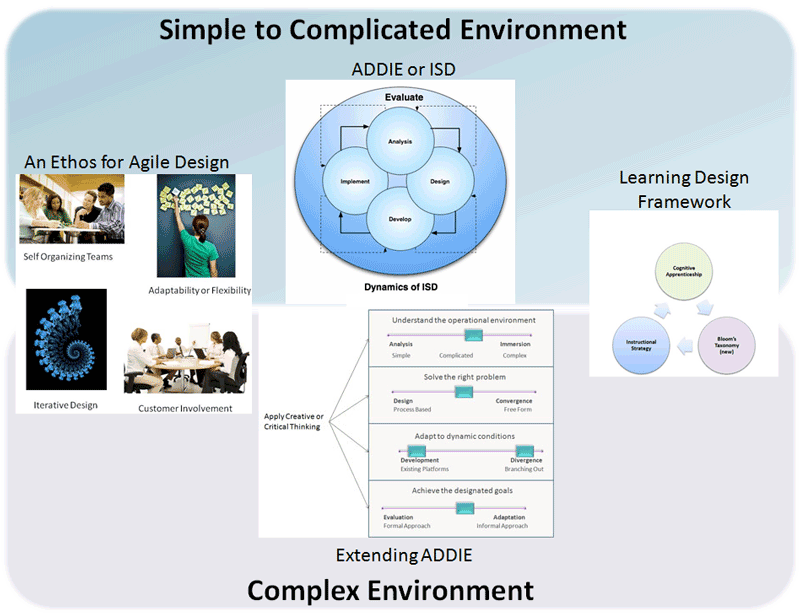 Training or a blended platform will normally be called for and if the task is highly complex, an in-depth performance support package might also be needed. Organizers are engaged by the task, but don't view themselves as being the primary task-holders. They might be a supervisor who needs to learn about the task, a person who will fill in part-time as a backup, or the task might simply be for the short-term. A just-in-time learning package, such as elearning might be used to give them the basic knowledge, followed by a highly detailed support package (job-Performance-Aid) that allows them to perform at the minimal requirements for a short period of time if needed. Onlookers are not fully engaged in learning the task because they will not be performing the task; however, they are fully engaged in other closely related tasks, thus they need to see how that task relates to them. 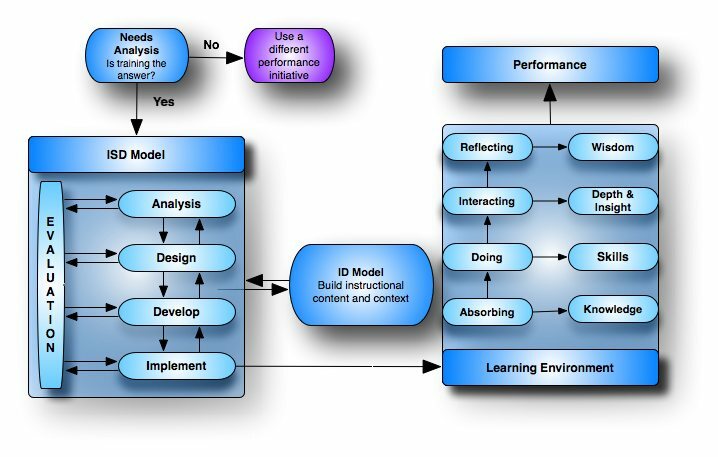 A basic elearning package that gives an overview of the task and how it relates to the organization might be a proper fit. Daydreamers have a long term view because they see it as a means to something else, rather than an end; for example, a means to do another task or job. However, they do not want to waste a lot of time learning the task, thus a quick and dirty elearning or the cheapest performance support band-aid available. Moggridge, B. (2007). Designing Interactions. Cambridge, Massachusetts: The MIT Press. Updated July 8, 2010. Created July 1, 2010.